After the blast, speculation immediately began to fly over who might be responsible. Many fingers pointed at ISIS because of the apparent target — a historic cultural area that&apos;s popular with tourists. Both Merkel and German Foreign Minister Frank Walter Steinmeier spoke of the country&apos;s losses today, saying that in addition to those killed, nine German nationals were severely injured, reports NPR&apos;s Esme Nicholson. "We&apos;d come out of the Blue Mosque and were just walking onto this boulevard. We were just in the corner, just out of sight. So we heard it, rather than saw. Then, people were just running in every direction. Some people were running towards the action, to help. And other people were just fleeing.... We were very much caught between a rock and a hard place." 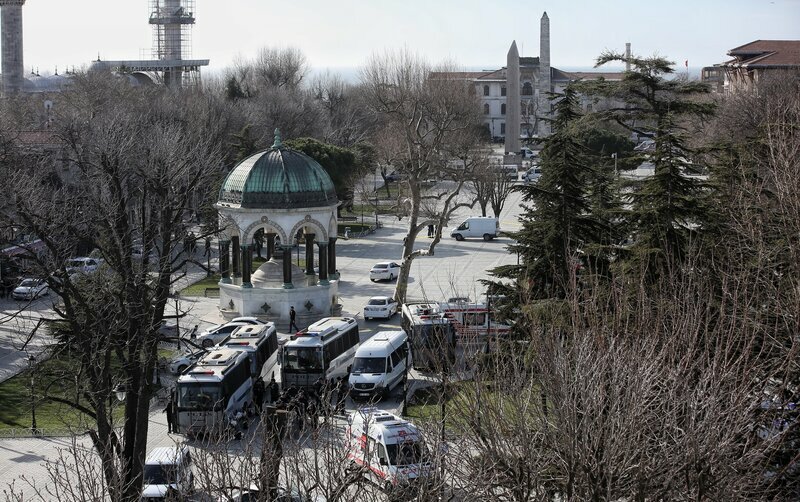 Tuesday&apos;s attack is the latest in a string of terrorist activity in Turkey. In October, some 100 people were killed in a double bombing in Ankara. In December, a blast at an Istanbul airport killed one person. And police said they foiled another double bombing in Ankara that was timed to strike on New Year&apos;s Eve.